"To discover your purpose in life you must turn to God's Word, not to the world's wisdom. You must build your life on eternal truths, not pop psychology, success motivation or inspirational stories," writes Rick Warren in his book, The Purpose Driven Life. "The Bible says, `It's in Christ that we find out who we are and what we are living for. Long before we first heard of Christ and got our hopes up, he had his eye on us, had designs on us for glorious living, part of the overall purpose he is working out in everything and everyone.'" The message of this book is what Christmas is really all about: the Messiah coming into the world to communicate his purpose for our life. The book is so profoundly written that it has sold 33 million copies in 50 languages - the best-selling non-fiction hardback of all time. My wife and I have been re-reading it in recent weeks. As a writer, I often underline important passages. However, every sentence is so meaningful I want to underline everything. "God was thinking of you long before you ever thought about him. His purpose for your life predates your conception. He planned it before you existed, without your input. You may choose your career, your spouse, your hobbies...but you don't get to choose your purpose." "The purpose of your life fits into a much larger, cosmic purpose that God has designed for eternity. That's what this book is about." The book is divided into 40 short chapters and is designed to be read one chapter a day. Each day ends with a Point to Ponder: On Day One: "It's not about me." Plus a Verse to Remember: "Everything got started in him and finds its purpose in him Colossians 1:16b (Msg). Finally a Question to Consider: "In spite of all the advertising around me, how can I remind myself that life is really about living for God, not myself." In Day Two, Warren writes, "While there are many illegitimate parents, there are no illegitimate children. Many children are unplanned by their parents, but they are not unplanned by God. God's purpose took into account human error, and even sin." For example, Warren quotes God saying, "I have carried you since you were born. I have taken care of you from your birth. Even when you are old, I will be the same. Even when your hair has turned gray, I will take care of you" (Isaiah 45:18). Many lead lives without a purpose-driven life. Even the prophet Job said, "My life drags by - day after hopeless day." Warren comments, "The greatest tragedy is not death, but life without purpose. Hope is as essential to your life as air and water. You need hope to cope." Contrast that with God saying, "I know what I am planning for you...I have good plans for you, not plans to hurt you. I will give you hope and a great future" (Jeremiah 29:11). 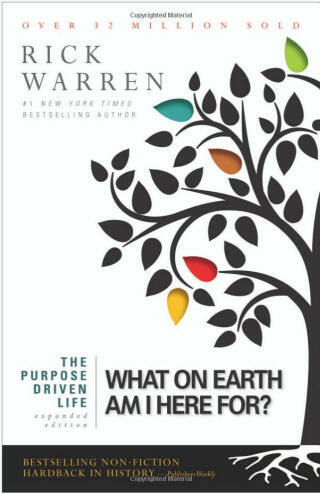 Without a clear purpose, you are likely to "keep changing directions, jobs, relationships, churches or other externals - hoping each change will settle the confusion or fill the emptiness in your heart," writes Warren. However, the Bible says, "Don't live carelessly, unthinkingly. Make sure you understand what the Master wants" (Ephesians 5:17). In college, James Dobson's goal was to become the school's tennis champion. He was proud when his trophy was prominently placed in the school's trophy cabinet. Years later, someone found it in a trashcan when the school was remodeled, and sent it to him. Jim's response: "Given enough time, all your trophies will be trashed by someone else." "What did you do with my son, Jesus Christ?" Jesus said: "I am the way and the truth and the life. No one comes to the Father except through me" (John 14:6). Second, "What did you do with what I gave you?" What did you do with your "gifts, talents, opportunities, energy, relationships and resources God gave you? Did you spend them on yourself, or did you use them for the purposes Gad made you for?" These are questions we ought to be considering this Christmas.